Directed by Greek filmmaker Yorgos Lanthimos, The Favorite is a sly, mostly on-target story of royal back-stabbing under the reign of Queen Anne that has been getting a lot of critical praise. As satire, it sets a high standard for itself, and, more often than not, it reaches it. But, whatever its limitations as satire – or of history – the spectacle of three enormously talented actresses battling each other for our entertainment is not likely to disappoint. 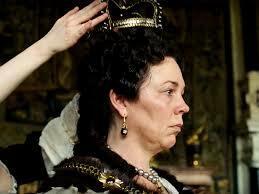 From a script by Deborah Davis and Tony McNamara, Queen Anne, played by Olivia Colman, is almost totally dependent on the Duchess of Marlborough for her royal and personal needs. 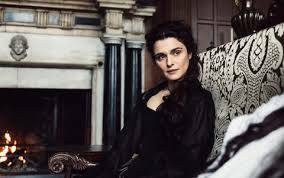 As played, brilliantly, by Rachel Weisz, the Duchess ferociously protects the Queen from any contact that does not first have her personal scrutiny. And she does this, with brazen self-satisfaction, to advance her own position in court. Her husband, a military commander, is almost a cipher in her life. Her goal is to advance his career, which, by connection, improves her position, because there was no other measure of a woman’s success in the England of the House of Stuart. She has become so indispensable to the hapless Queen, that she in effect rules England with a nod of her head, and she smugly sees nothing that threatens her power. 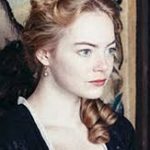 The story begins with the arrival in court of the Duchess’ distant cousin, Abigail, played by Emma Stone. Although young, and with a deceptively sweet demeanor, she has been hardened by a series of nasty events since she was fifteen, when her father “lost” her in a card game to a fellow debauchee. Her family now destitute, she comes to court hoping for a servant position with her cousin. Rather flattered, the Duchess gives her one. As it turns out, it is a move that she comes to regret. Now set in motion, the plot is simply the progression of steps by Abigail to replace the Duchess in the Queen’s favor, and the Duchess’ moves to destroy her rival. As in a fencing match, the moves are quick, deceptive and, sometimes, accompanied by physical blows. Both ladies are tough, sustain many hits and are fascinating to watch. Yet somehow, after an hour or so, an undertone of pathos blends in, and rather unexpectedly. This is all to the good, especially since the roughhousing was getting a little predictable. Gradually, the accumulation of details of Anne’s helplessness, physical pain and desperate need for intimacy serve to soften the overall tone of the film. The laughs still come, but are choked off more quickly. Anne has painful gout, and spends much of the time in a wheelchair guided by the Duchess. Ugly sores on her legs need bathing and bandaging. The Duchess, however, has no medical skills, and Abigail seizes the opportunity by making a soothing paste from forest herbs that so relieves the Queen’s pain that she bids the girl to stay by her constantly, thereby infuriating the Duchess. Anne was married to Prince George, who does not appear in the film. She delivered seventeen children, who were mostly stillborn. The few born alive only managed to stay with their mother “a little while” before succumbing. She keeps their memory alive with the company of seventeen rabbits that the servants care for in her chamber. While the female rivals are shown mostly in medium shot, Lanthimos advances the story with many close-ups of Anne’s face to signal whom she favors at the moment. One near feature-length closeup has Anne watching the Duchess dance with a boy-toy in Court (with uproarious choreography), and becoming so frozen with jealousy that she revokes a land tax, that had been a special project of the Duchess, as punishment. Lanthimos’ skill with actors is strikingly evident. The actresses must convince as creatures driven by intense ambition and envy, yet are often pressed into almost cartoon-like behavior. Of the three, Stone is not quite as comfortable as the other two. A reserve of sweetness served her well when a character was only occasionally rude, but not vicious, as in Birdman, but that quality is just an impediment here. But she has some priceless moments, notably when she gives her husband a thoroughly bored hand-job – on their wedding night! – while she thinks aloud about her next sneak attack. The film is sometimes more interesting than funny, and the female roughhousing loses its shock value after a while. For sheer hilarity, Armando Iannucci’s The Death of Stalin is still tops. As led by Steve Buscemi’s grotesquely hilarious Kruschev, the lethal hi-jinks of the Politburo register higher on the laugh meter. This is political cartooning of the highest order, yet also uncannily credible, considering what we know of this ruthless bunch. In comparison, The Favourite’s view of the war with France is skimpy and blurred, especially in how it shows the power players, all men save for Anne. The only male actor given more than a walk-on is Nicholas Hoult, as leader of the landowners. His big scene, culminating in a fuming stare-down with Weisz, is delicious. 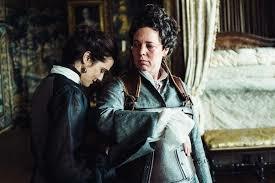 But no single figure in this film, or in Ianucci’s, is as substantive, or as memorable as Queen Anne, and that is entirely due to Olivia Colman, who is magnificent. In an interview, Lanthimos has said he never considered any other actress. Anne is a towering figure. In spite of her fragile health, Anne exults in power, whether to impose tyrannical rule over the Court and her subjects, or to exploit her minions for degrading personal care, including sexual favors. At times barely audible from weakness, she can also cause knees to shake from her bellowed commands. Anne could easily have been shown as a monster, but Colman’s artistry prevents that. She gives a total, yet amazingly unforced performance. She fully captures the woman’s humanity, as well as her terrifying mystery.